This intensive certificate course will teach you all the basics on how to get that professional look! Perfect your day and evening makeup applications by using multiple techniques and products. 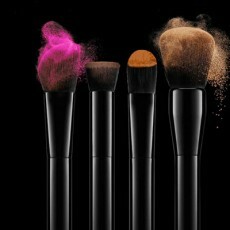 The one week beginner make-up artistry course can be done on a full or part time basis. If you want to do more with your spare time and earn extra money then this certificate course is for you. You will be able to specialize in wedding make-up once this course is completed. Learn how to achieve a flawless photo-friendly makeup application on your client for her special day. The two week bridal make-up artistry course can be done on a full or part time basis. Getting started as a makeup artist, we cover all day / evening, bridal and fashion makeup. This course allows you to get more practical experience and teaches you a variety of different make-up techniques taught by our professional lectures. With small class sizes you will benefit from one on one attention to ensure you reach your certificate level. We include waxing and tinting to give you the upper hand in the industry. PLEASE NOTE: All dates below need to be attended; lessons occur twice a week – plus exam Saturday class. When reading below information remember to factor in which course you would like to attend – One / Two or Four Week Part Time Course. IMPORTANT: The Part-time course will only take place if there are a minimum of 4 students that enroll. The “HALF DAY” course gives you an opportunity to perfect your day make-up application on your own face. This group session allows us the opportunity to demonstrate and help you to apply all the necessary steps with so much information on the “why” and “how” to get that flawless look. The “FULL DAY” course covers “The Half Day Course” above information; we will teach you how to contour your face and apply a winged eyeshadow application. Whether you are new to makeup, or consider yourself a pro, our group session full day course allows you the opportunity to get creative and intensify your personal evening application. PLEASE NOTE: Dates / Courses / Prices are subject to change without prior notice.